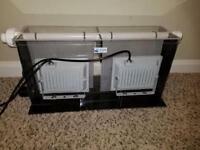 Custom Sump for Fishtank Aquarium I-Series Sump 96"x48"x34"
180 Gallon Saltwater Tank Aquarium w/stand and canopy. christianmanny2011 has no other items for sale. Details about 200 gallon Fish Tank, Aquarium with Stand and lid with led lighting. 200 gallon Fish Tank, Aquarium with Stand and lid with led lighting.